When Chuk Iwuji auditioned for the Royal Shakespeare’s History Plays, it was for a relatively small role. Only to realise he had a date with destiny. He speaks with a staunch confidence, gives an effusive response to every question asked. Chuk Iwuji holds nothing back. Currently playing the role of Henry VI, Parts I, II and III in The Histories, a production by the Royal Shakespeare Company, at The Roundhouse Theatre, Camden. Iwuji understands he has a story to tell and he is not afraid to let it all out. The Histories, a fistful of plays by William Shakespeare popularly known as the History Cycle opened in Stratford-Upon-Avon, back in 2006 to critical acclaim and rapturous audience response. Directed by Boyd, history was in the making. The RSC was doing what no other theatre had ever done, working with the same group of actors over the course of two and half years to stage all eight plays. Boyd was once again, breaking down casting barriers with a black actor in a lead role. His favourite of the trilogy is Part III because “He gains a state of enlightenment. He goes into another cosmos and it’s the first and only time in all three plays, he is allowed to sit down with the audience and say ‘this is how I feel.’ I am relived that I can do that,” he says. Despite the magnitude of Henry VI as a character, Iwuji is confident in his ability and sense of responsibility to his character. However, he does not believe any character should be bigger than what it is – a character. “I know there is a big myth about some of the great characters like Hamlet and Othello. I don’t believe that because you approach them the same way you approach any role. You try to understand them. You learn your lines and find the core and truth of the character.” He also thinks there is no reason why he should not play the role of an English Monarch on stage. “Well, shy shouldn’t I?” he asked. 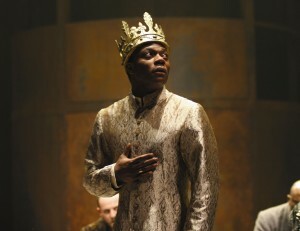 While the role has been challenging due to its demands on him as an actor, Iwuji also admits that living and breathing the words of an English King on stage has been the highlight of his career. “If you want a summation of it, it’s been the most joyfully, challenging, frustrating and enlightening experience of my life.” Iwuji, who comes from a close-knit family, explains the moment that will forever stay with him was the day his parents came to see a trilogy of Henry VI. He said: They sat through it all and as the audience went mad at the end, I spotted them. I could see my mum and dad with the biggest grin and it almost like everything they had done; best schools, trying to make life as easy as possible and support up until then, led to that moment. So, yeah, that has to be it,” he says. Note: This article was written in 2008 and first published in The Voice Newspaper. Watch out for Chuk Iwuji in the forthcoming production of Thebes at the National Theatre. This entry was posted on Sunday, June 6th, 2010 at 12:49 am	and is filed under Features, Interviews, Journalism, People, Theatre Interviews. You can follow any responses to this entry through the RSS 2.0 feed. You can leave a response, or trackback from your own site.